Whether you're a new student, faculty, or staff member, the key to accessing campus web-based applications and e-mail services is your My MCC ID. What is a My MCC ID? Every student, faculty member, and staff member are provided with a My MCC ID -- which is your user ID and password. For students, My MCC ID is your 'A' number. For faculty and staff your My MCC ID is a combination of your last name and first initial. Your My MCC ID provides you access to the My MCC Web Portal, your email account, OneDrive, online Blackboard courses, wireless network, and MiddleNet online schedules, grades, billing, and financial aid. How do I receive a My MCC ID? My MCC ID's are distributed to students during orientation and registration, and to faculty and staff through the Human Resources Office. There is a quick and easy Online Self-Service Tool you can use to look-up your user ID or reset your password. 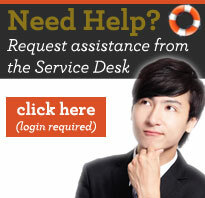 Contact the Service Desk at 978-656-3301 if you need assistance using the Online Self-Service Tool. Due to missing or incorrect data, some students or employees may need additional assistance with their My MCC ID and password. In those cases, students should contact the Student Information Centers at 978-656-3370 or toll free at 800-818-3434; for faculty and staff contact Human Resources at 781-280-3531. Now that you've got the basics, view the Technology Guides for more information on the services available at Middlesex Community College.